First issued in May of 1994, the lovely image in Gypsy Red and India Ivory didn't stir many emotions. Not until it was discovered that the production run was small, did the car rank high on the list of most collectors. Again released, totally unchanged, in July of 1999, the car was the subject of much conjecture. I am not going to address that issue as I cannot lend any factual information. I will only extol the merits of the mid 90's diecast itself. We did not expect engine wiring or working suspension in '94 and the Bel Air did not offer them. But the suspension height is perfect, the paint and panel fit is precise and the model appears crisp and clean. The side moldings align unerringly, the fuel filler door and indicated fender skirt junctions are stamped deeply and faultlessly. Not only is the side vent wing glass included on this model but if you look at them from above, they take on the illusion of being cracked open very slightly. Of course when you pull back the continental kit you gain access to the carpeted trunk. 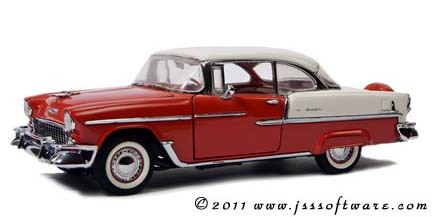 This was and still is a viable precision model of one of the most popular cars in American history. In this two-tone paint job, it sparkles among the best cars of today or yesteryear. This original-owner collection was purchased directly from The Franklin Mint and various gallery stores, then placed in his climate-controlled Corvette garage. Most were never opened and still retain their factory shrink wrap and tape! Excellent-good condition original boxes, some without postage or writing. All models will be opened and carefully inspected by Vinny before shipment.